The CIE - "La Commission Internationale de l'Éclairage"
To provide guidance in the application of principles and procedures in the development of international and national standards in the field of lighting. To prepare and publish standards, reports and other publications concerned with all the matters relating to the science, technology and art in the fields of light and lighting. To maintain liaison and technical interaction with other international organisations concerned with matters related to the science, technology, standardisation and art in the field of light and lighting. The CIE is recognised as the authority on all aspects of light and lighting. As such it occupies an important position among international organisations. In 1931 the CIE developed the XYZ colour system, also called the "norm colour system." This system is often represented as a two-dimensional graph which more or less corresponds to the shape of a sail. 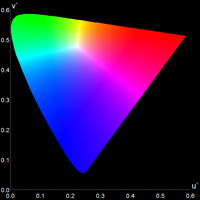 The CIE colour standard is based on virtual primary colours XYZ (tristiumuls values) which do not exist physically. They were originally derived from the colour matching stimuli R, G and B (red, green, blue: 700, 546.1 and 435.8 nm) such that the XYZ values are positive for any colour which was not possible with RGB. X, Y and Z are, however, purely theoretical in contrast to colour gamuts such as RGB or CMYK (cyan, magenta, yellow, black). These primary colours have been selected such that colours which can be perceived by the human eye lie within their colour space. The XYZ system is based on the response curves of the eye's three colour receptors. Since these differ slightly from person to person, the CIE has defined a "standard observer" whose spectral response corresponds more or less to the average response of the population. This objectifies the colourimetric determination of colours. The three primary colours of the CIE XYZ reference system call for a spatial model with coordinates X, Y and Z, which can be drawn as a chromaticity triangle. To arrive at a two-dimensional diagram (see Fig. 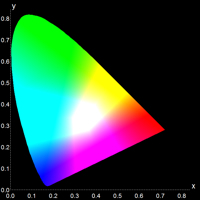 1), this chromaticity triangle is projected into the red-green (X/Y) plane. This is only meaningful, however, if appropriate standardisation is performed at the same time which allows the lost value Z to be read from the new two-dimensional model. This is achieved by introducing the chromaticity coordinates x, y and z. A colour is not fully defined by its chromaticity (x and y). A brightness coefficient also needs to be specified as well. 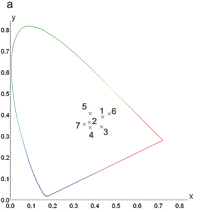 Although the x, y chromaticity diagram has been widely used, it suffers from a serious disadvantage: the distribution of the colours on it is not uniform. This is illustrated in Fig. 3: Each of the short lines in this figure joins a pair of points representing tow colours having perceptual colour difference of the same magnitude, the luminances of all the colours being the same. Ideally these identical colour differences should be represented by lines of equal length. But it is clear that this is far from being the case, the lines being much longer towards the green part of the spectral locus, and much shorter towards the violet part, than the average length. The u', v' diagram is useful for showing the relationships between colours whenever the interest lies in their discriminability. where u'n , v'n are the values of u', v' for the appropriately chosen reference white.  Here, L* denotes the lightness of the colour, ranging from zero (black) to 100. Fig. 5: The CIE L*a*b* colour space, based on the differences of two elementary colour pairs red-green (a) and blue-yellow (b). The brightness is taken into account by the L value that ranges from 0 (black) to 100 (white). where u and v denote the colour coordinates in the 1960 CIE uniform chromaticity diagram. If the chromaticity difference between the lamp to be tested and the reference illuminant is greater than a given maximum tolerance of 5,4*10-3 µK-1 the resulting Colour Rendering Index may be expected to become less accurate. Yttrium aluminium borate (YAB) is a well-known host for metal ions. Rare-earth and transition metal doped materials can be used as lasers because of their outstanding optical properties and have been investigated. In YAB, The Y3+ ions are located in trigonal prismatic sites with D3 symmetry, the metal ion is co-ordinated to three oxygen atoms from the borate top and bottom layers, where the two triangles are slightly rotated against each other. The Al3+ sites show almost perfect octahedral symmetry. Upon doping, the rare earth ions replace yttrium ions whereas transition metal ions such as Cr3+ are substituted for Al3+. For most of the optical applications of the YAB system the luminescence properties of the doped materials are of importance. The co-doped materials Ho,Nd:YAB, Ho,Cr:YAB, Nd,Cr:YAB and Ho,Nd,Cr:YAB reveal interesting colour rendering properties. In this context it is their absorbance, which gives rise to their colour change. Holmuim and Neodymium sesquioxides already show slight colour differences between daylight and fluorescent tube illumination. This perceptual colour difference is enhanced drastically when these elements are used as dopants in the YAB host. Furthermore, their combination in the same host increases the variety of colours - an effect which cannot be achieved by simply mixing the oxide powders. Chromium shows strong absorptions in the visible range. 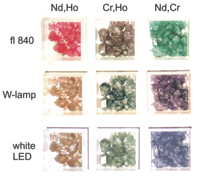 In combination with Ho3+ and Nd3+, Cr3+ enhances the crystals’ hue. Ho:YAB, for instance, is yellowish brown in daylight and pink when illuminated with a type 840 fluorescent tube. If Cr3+ is added, the crystal will still look pink in the latter case but will be dark green in daylight. An example of the different chromaticity co-ordinates of the crystals is given in Fig. 7. The colours of Nd,Ho:YAB; Cr,Ho:YAB; Nd,Cr:YAB and Cr,Nd,Ho:YAB under illumination with seven different white light sources are shown in Fig. 8. The materials change their colour upon illumination with different white light sources so dramatically that they could be used for light source discrimination; the microcrystalline powders on the other hand could be used as novel coating materials with a colour changing effect that depends on the spectral distribution of the illuminating light source. A very good overview and detailed descriptions on measuring colours are given in R.W.G. Hunts book "Measuring Colour", Ellis Horwood Publishers (1987) and in the technical reports obtainable at the CIE. More references on this subject and references on YAB can be found in the paper given below.